A groundbreaking new DVD that explains the true nature of Vatican II’s “new” approach to Church unity that is contrary to the manifest will of Christ. 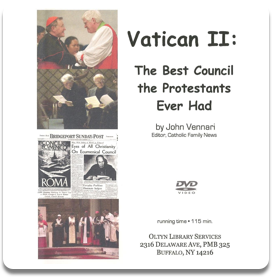 • Who was the Protestant who called Vatican II “The Best Council the Protestants Ever Had”? • Why do Protestants and Freemasons rejoice over Vatican II? • What Protestant organization does the Conciliar Church imitate in its new approach to unity? • Is it possible for a Council to fail? Along with this and much more, the video contains footage of a bizarre interfaith prayer service at Notre Dame; scenes from rock’n’roll charismatics at Steubenville; the Hindu ritual at the altar at Fatima; the dramatic confrontation at Fatima during the traditionalist pilgrimage of reparation, and more! Has been called “a great piece of work”.